Roses are a perfectly acceptable thing to give your Valentine, but ... what if they're hungry? This year, instead of cliché flowers or boring old chocolates, consider giving your boo a bouquet of junk food. For a limited time, Canadians in select areas of Toronto, Vancouver, and Montreal can send their sweethearts a savory alternative. 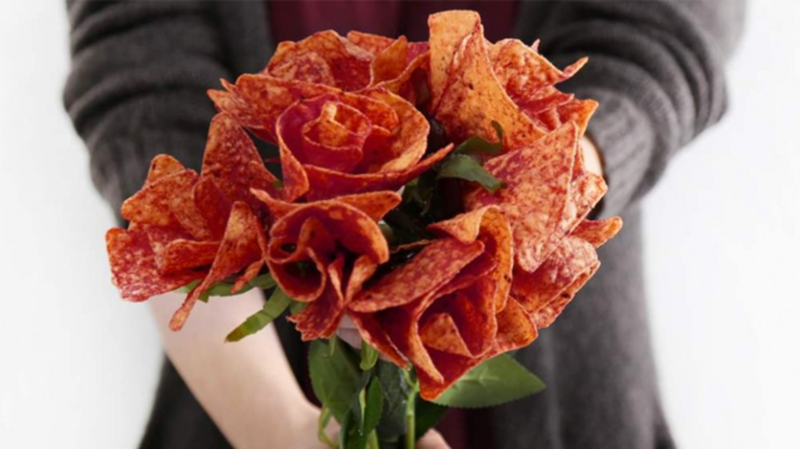 In honor of the return of Ketchup Doritos, the company is hand-delivering their chips in the form of roses to a few lucky recipients. The package features 12 long-stemmed Doritos Ketchup rose flowers that will make any hungry snack lover swoon. Delivery is free and the bouquets come with a bag of chips that you can actually eat. And, the red hue of the ketchup is perfectly Valentine's Day-themed. Now for some bad news: the bouquets appear to be sold out, but fear not! You can always construct a collection on your own with your favorite Doritos variety. Delicious and homemade—just don't chow down if you're using glue.